As we all know, May 24th in Stockholm, has become a huge game due to United’s failure in front of goal in the Premier League. As a Manchester United fan, the Europa League is a competition that for a long time we’ve looked at and seen as irrelevant and insignificant in all honesty. Now we find ourselves, 4 years after Sir Alex’s departure, relying on this competition to provide a stepping stone to the Champions League group stages, and beyond that, a squad that we hope will start to look like a Champions League squad. Manchester United have won 20 league titles and 3 European cups; that’s a staggering statistic when you look at the club’s current league position. The size of the football club, in football terms and commercial terms, is enormous and it is unacceptable that United are not currently challenging for league and Champions League honours. But, this is the situation we find ourselves in, and this upcoming Ajax game in the Europa League, is the biggest for a long time. Another trophy to our collection, in fact, the only trophy the club has never won, would be fantastic, but Champions League football is the key for United. This leads me onto predicting a realistic starting 11 for United next season, because playing in that competition will impact our signings massively. I have tried to predict some realistic signings, judging by the current transfer rumours circling. David de Gea – The Spanish number one appears to be on the brink of moving to Real Madrid for what seems like the hundredth time, but will Champions League football be the defining factor in keeping him at the club? Antonio Valencia – He has become a key figure in this current United team after converting into a solid full back, even captaining the side in a European semi final. Every fan would be more than happy to see him remain our first choice right back. Eric Bailly – What a signing by Jose Mourinho. Rarely put a foot wrong, apart from his 2 silly Europa League red cards, the second meaning he misses the final. Those aside, Bailly looks as though he can be United’s main centre back for many many seasons to come. Jose Giminez – The tenacious Uruguayan defender may be just what United need along side Bailly. Atletico Madrid are a team full of that type of player who know how to win ruthlessly. Having been linked with United recently in the Daily Mail, let’s see how this one unfolds. Luke Shaw – Like every other United fan, I’d like nothing more than to see Shaw succeed at the club. I really hope Mourinho stands by him after his horrible injury problems, because he has the potential to be both United and England’s first choice left back for years. Ander Herrera – In my eyes he could well be a future United captain with his work rate and leadership skills. He has finally found his perfect position for United at the centre of that midfield, winning the ball back and driving us forward. Everybody loves Ander, such a likeable player. Paul Pogba – Quite simply, he has all the potential to be the best midfield player in world football. If he wasn’t at United, the club where every opposing fan wants to see people fail, that wouldn’t be a big statement at all. The stats and ability are there for all to see, but the price tag may have brought extra pressure at times. One of the most unique styles of play for a centre midfielder, and I’m excited to see him pull the strings for United for a long time. James Rodriguez – The transfer rumours seem to be gathering pace on social media, and he’s a signing all United fans would be delighted to see. 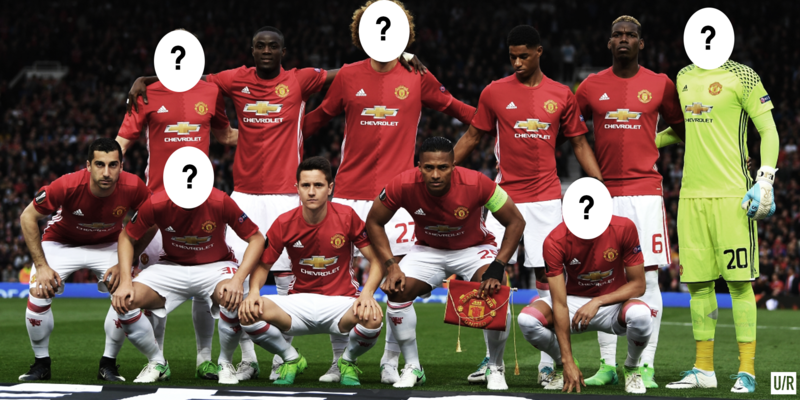 When you ask yourself would you rather see Rodriguez or Lingard/Fellaini off the front 3, it’s a bit of a no brainer! Antoine Griezmann – Once again, does Champions League football appear to be the final factor for this transfer? It’s been a story that doesn’t seem to be going away and let’s hope it is true. As one of the front 3, Griezmann will inevitably bring that cutting edge we have lacked all season. Henrikh Mkhitaryan – He had his problems adjusting at the start of the season but he is clearly a fantastic talent who Mourinho is a big fan of, and so are all of us United supporters. I look forward to seeing him from the very start next season and if United can capitalise on all the created chances, his Dortmund assist tally will surely be matched. Marcus Rashford – I think next season will be his season. Don’t get me wrong, he’s been brilliant so far in his first season and a half, but I want to see him become our main centre forward starting regularly with Griezmann and Mkhitaryan either side, and James just behind him. It’s an attacking side I know, but hasn’t that always been the United way? Continuing in that 4-2-3-1 formation, this team would take some stopping. It’s probably wishful thinking in parts, but like I said, I’ve tried to be as realistic as I could depending on Champions League qualification. Has Mkhitaryan been a hit, or got away with it in his debut season? James Rodriguez to Manchester United – Is it worth it?